ECI Furniture helps you to keep the class in classically designed furniture. ECI designs are noteworthy because they strike a perfect balance between traditional styling and modern durability. The Walnut Slate Bar Stool remains faithful to the past with its simple pub-style build and deep, matured finish. But, it simultaneously features certain comfort features of modernity. For example, the high seatback made with a slat design is curved and designed for support. The seat features a cushion wrapped in easy-to-maintain vinyl fabric, and it sits atop a 360-degree swivel for heightened usability. A footrest stretches across the entire base of the stool. 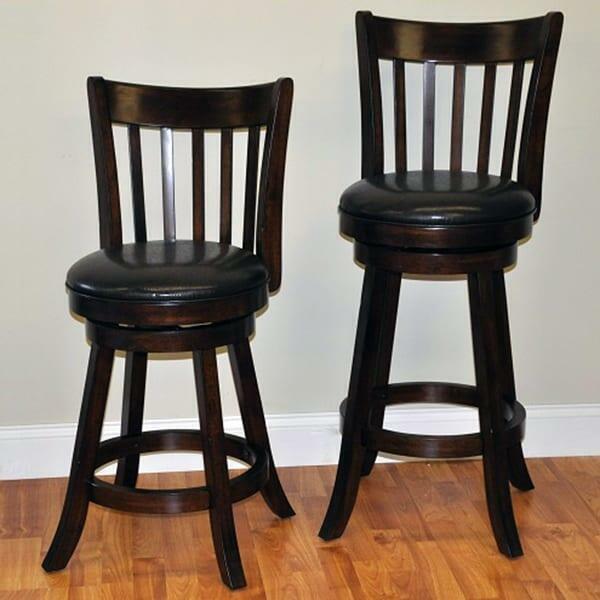 Pull the Walnut Slate Bar Stool up to your home bar. You and your pub mates deserve it!